That's right...it looks like rain is in our forecast. Actually, that's not such a bad thing for us. 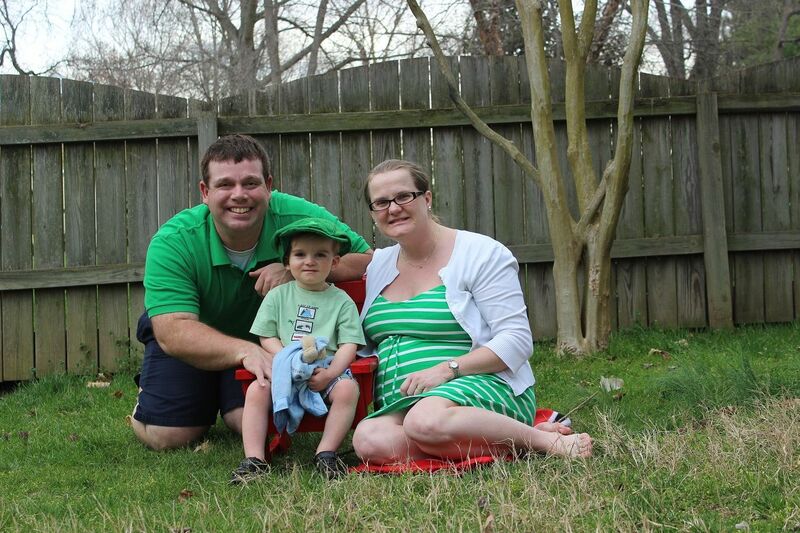 We are not a family that can just enjoy a beautiful weekend like this one. Unfortunately, weather like we've had in Spring means more work time for Daddy. Spring is fire season here in North Carolina. It is just frustrating to me that my husband cannot just be at home with his family on beautiful days and has to respond to fires that are usually caused by the ignorance and carelessness of others. Yes, most outside fires are the result of careless human actions. *Sigh* Okay, that's enough of my ranting. Evan, Brody, and I did try to enjoy as much of the lovely Spring weather as we could and spent most of the afternoon on Saturday in the yard. 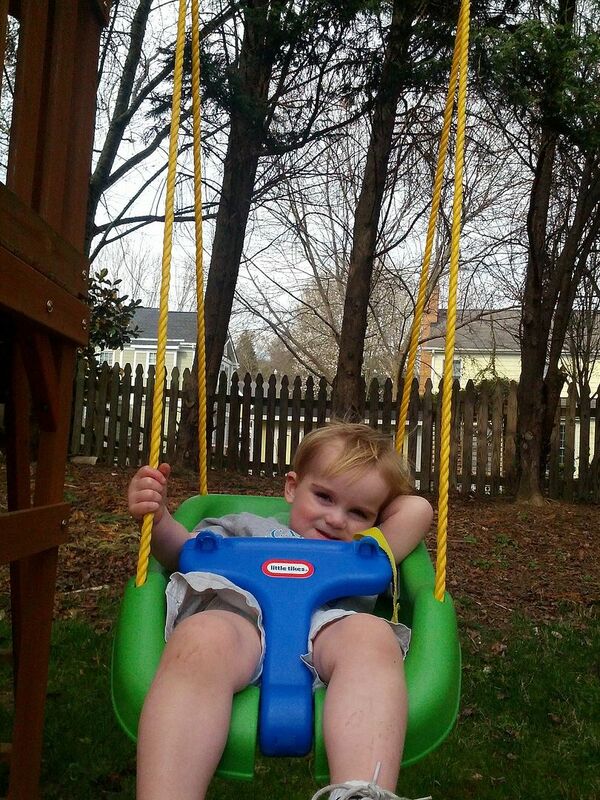 On Sunday afternoon, Evan enjoyed a play date over at his cousins' house while Brody got a much needed nap and then enjoyed some playtime with Mommy. 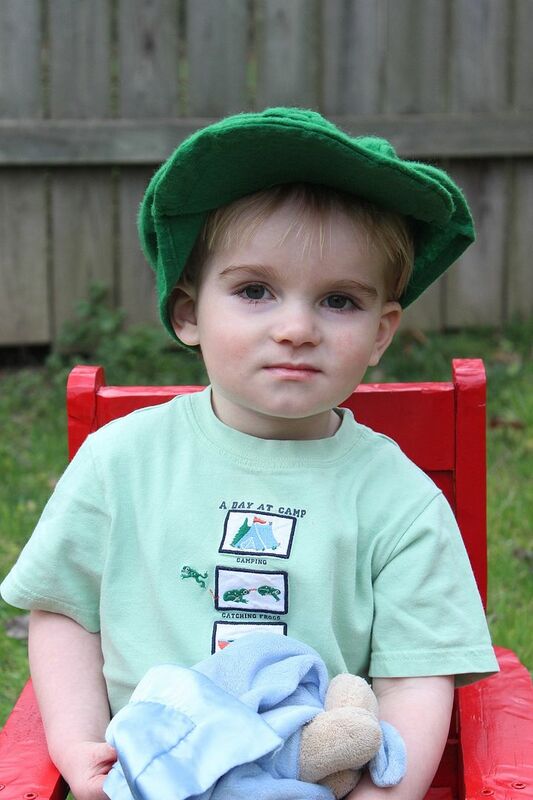 When Daddy arrived home, we did get some pictures in our St. Patty's Day green. 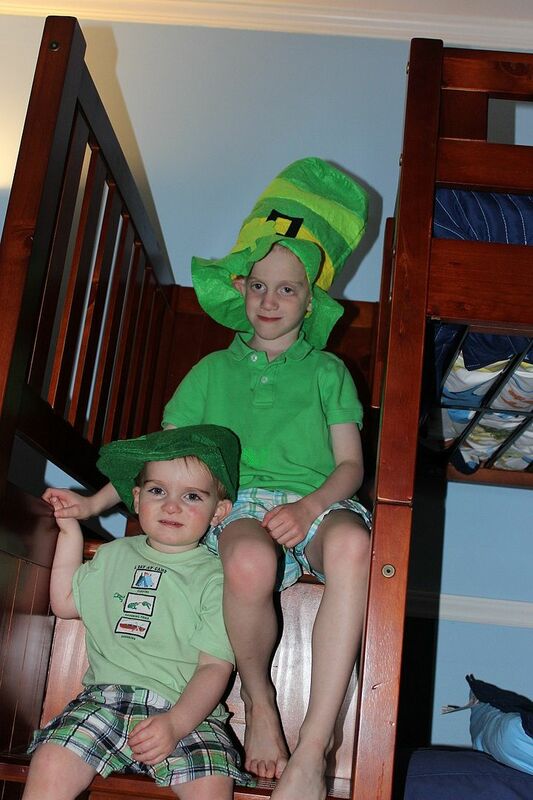 I didn't do as well this year as I didn't ever buy the boys new St. Patty's Day shirts, but they both do seem to have plenty of green attire, and they wore their hats from last year. That sweet little coy smile. 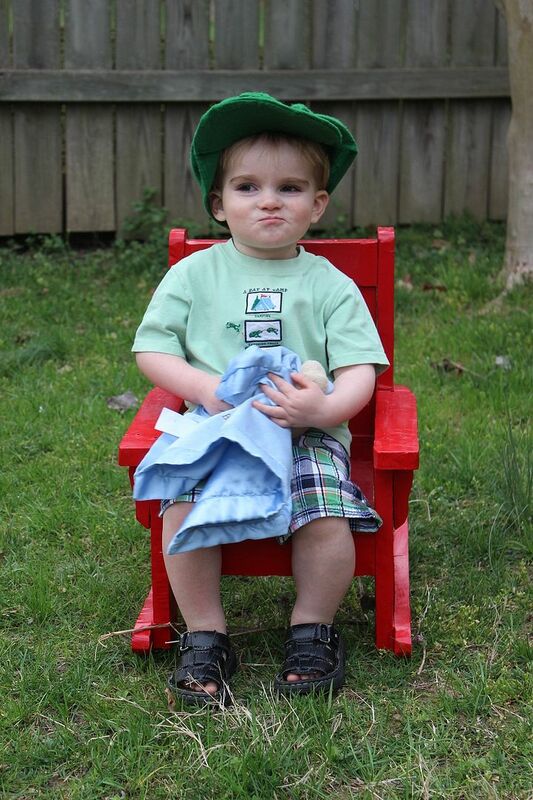 Oh yes, he has definitely learned to make cute and silly faces for pictures. He was so very cooperative for these pictures. Must have been because a certain little red head who likes to stir him up was missing. Waiting for Daddy to join the picture. Looking like just a family of 3 again as big brother was enjoying his fun play date. 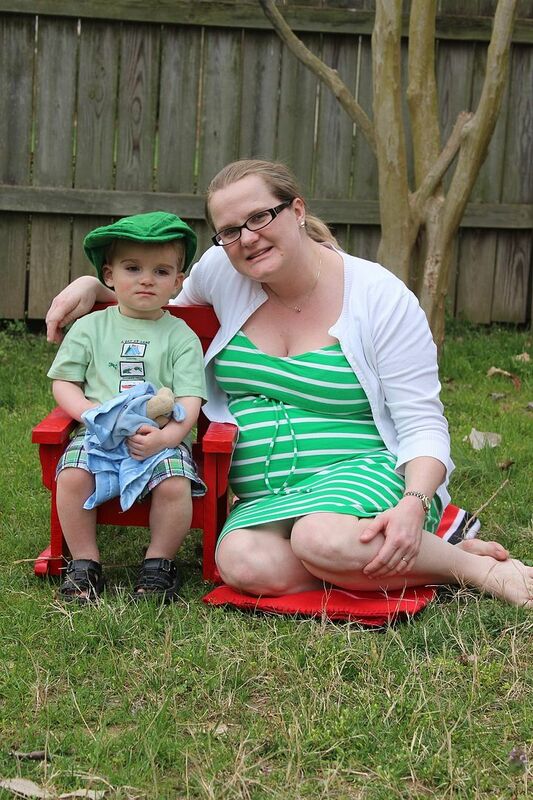 Mommy and her little man enjoying the beautiful weather. 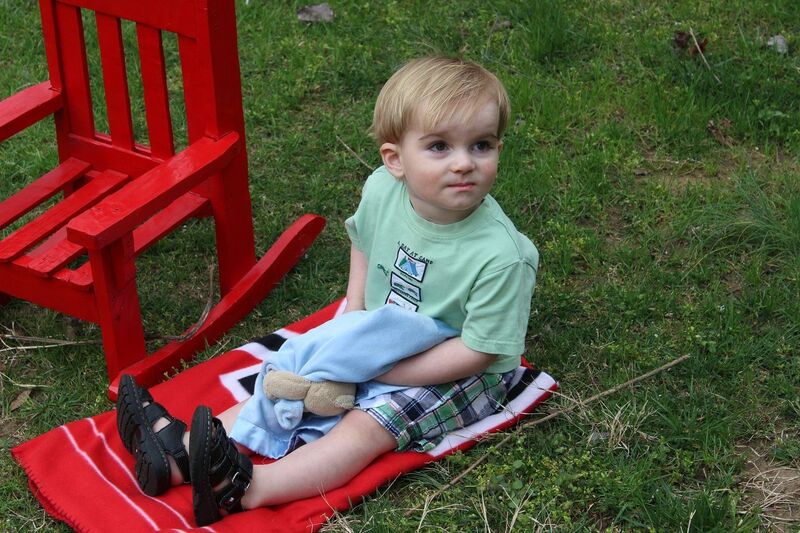 He just sat down on the blanket to wait while Daddy took Mommy's picture. 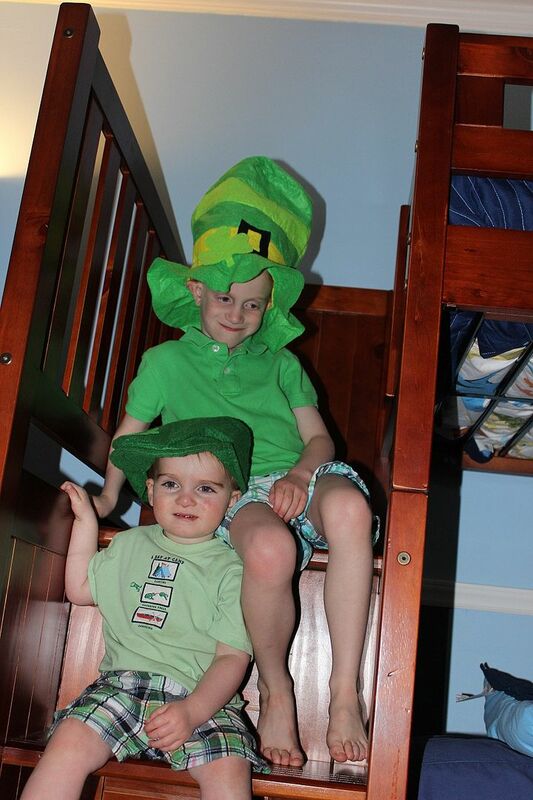 After dinner and before baths, we just had to get a picture of both of our little leprechauns. 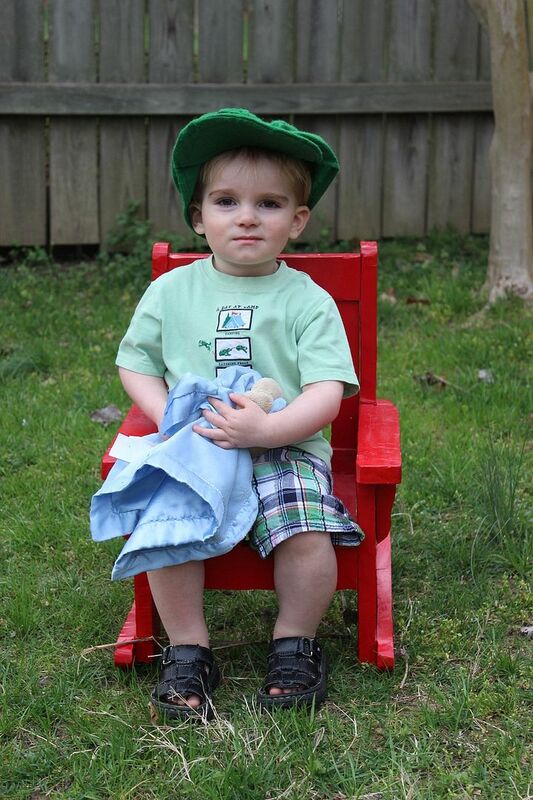 I have always said Evan really must be a leprechaun...red hair, fair skin like the Irish, small size, birthday in March close to St. Patty's Day, favorite color of green, etc. 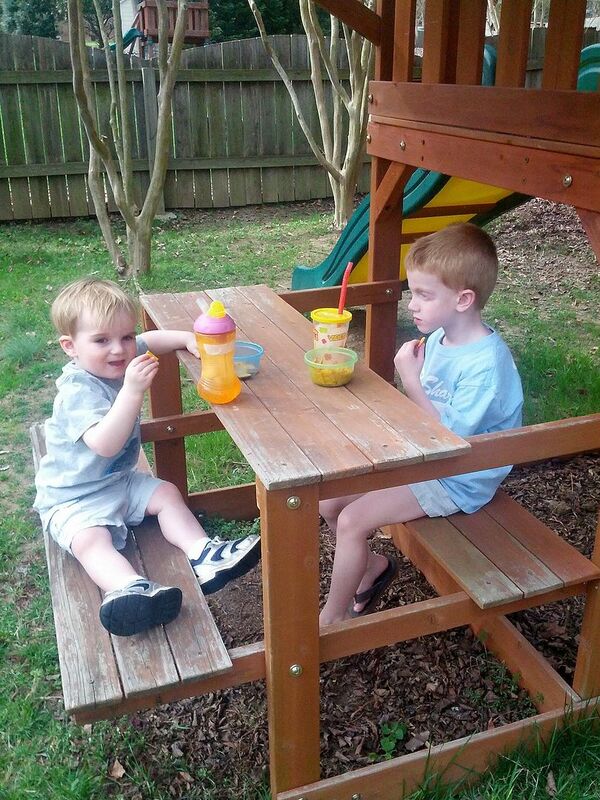 Love those sweet little guys. Love Brody's face in this one. 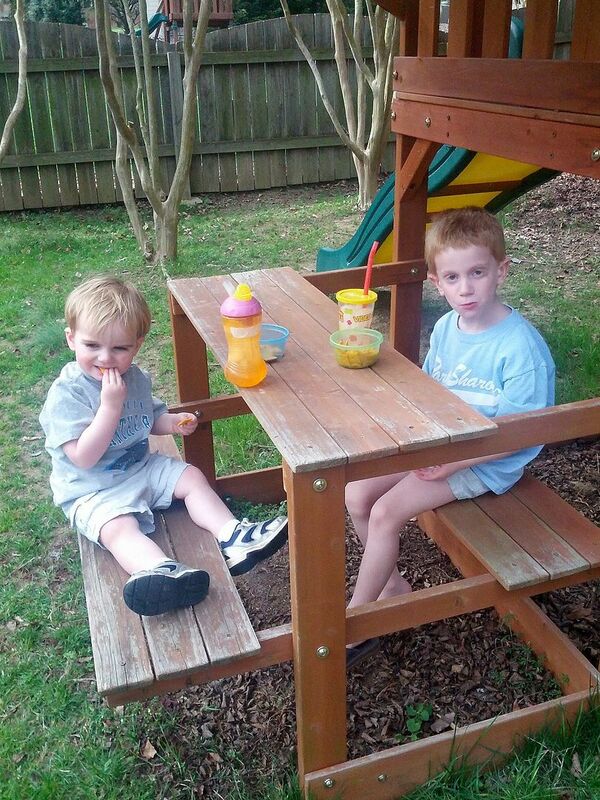 On Saturday, the boys enjoyed a little picnic snack outside. They really just enjoy being together. 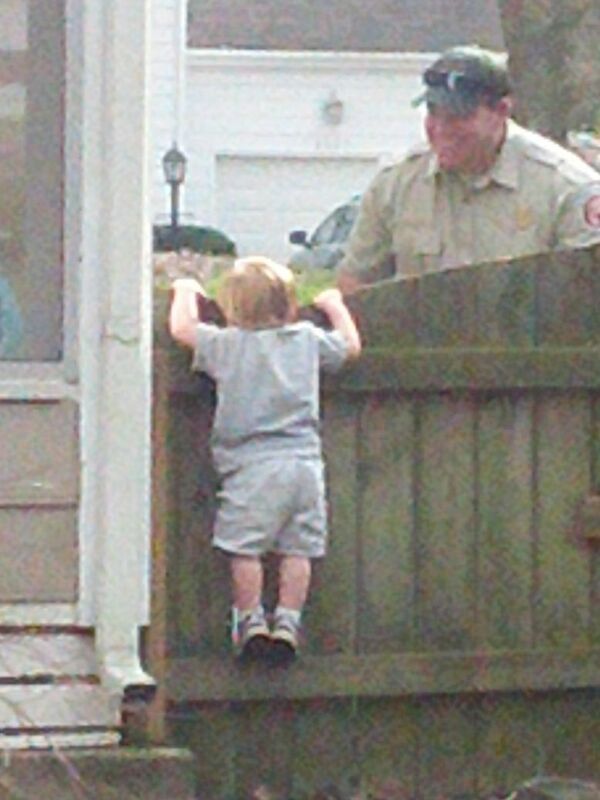 When Brody spied that Daddy was home, he tried to climb the fence to get to him. I grabbed my camera phone from across the yard and zoomed in so this one is a little grainy. Daddy helping his boy up. When we come in from outside, Brody knows we wash our hands. However, he beat me to the bathroom this time and had started the process. 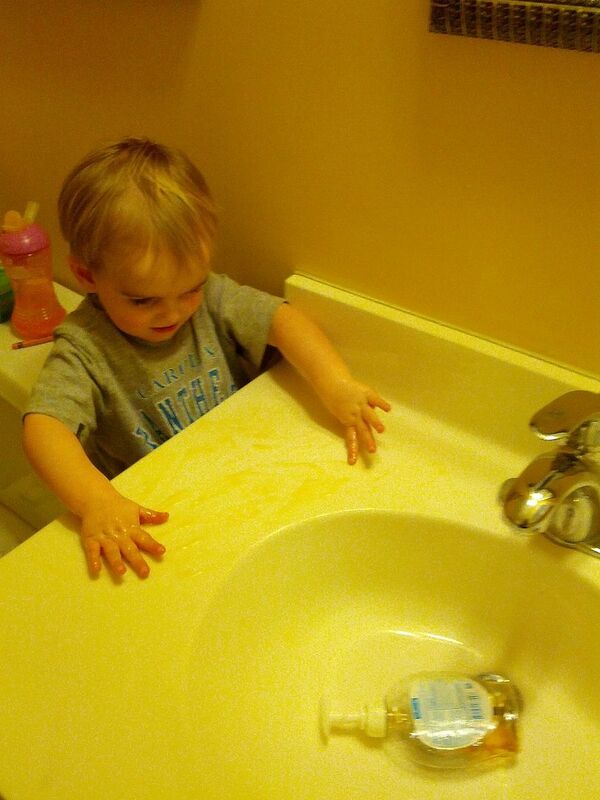 He had all of the soap poured out on the counter and was rubbing his hands in it. He tried to reach for the water to rinse but couldn't quite make it. I love those hats! Now I want to look for some for my boys for next year. You'll have to get a big green bow for baby girl next year! 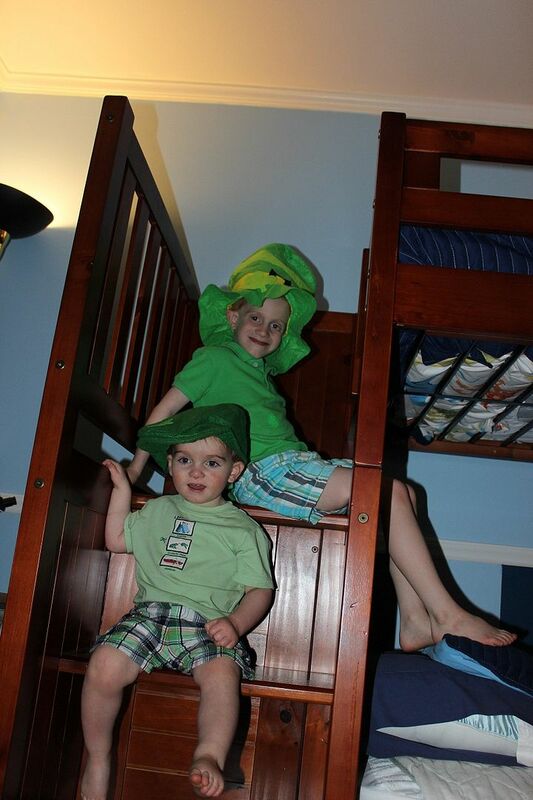 I like the bunkbed location for pictures. I see lots of photo shoots happening there. 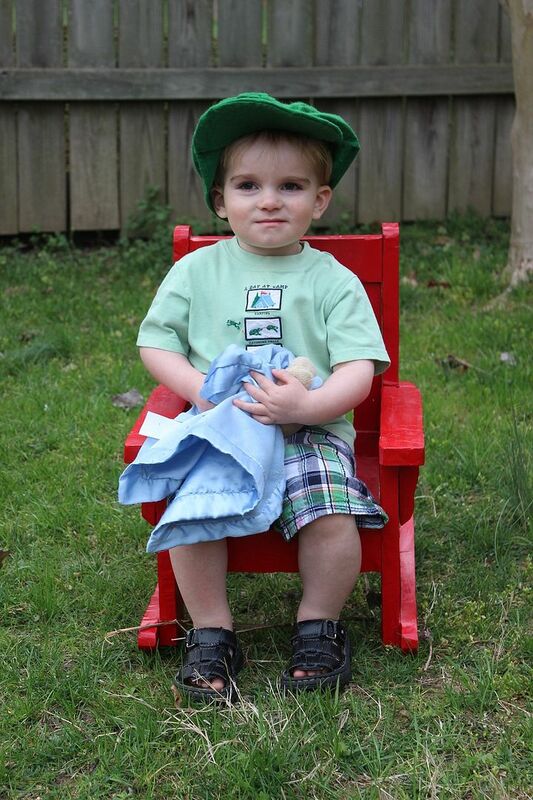 Yep, they wore the hats last year so you can imagine how big Brody's was on him then. I should have posted a flashback picture, huh? I probably got them from the dollar bins at Target knowing my love for them. 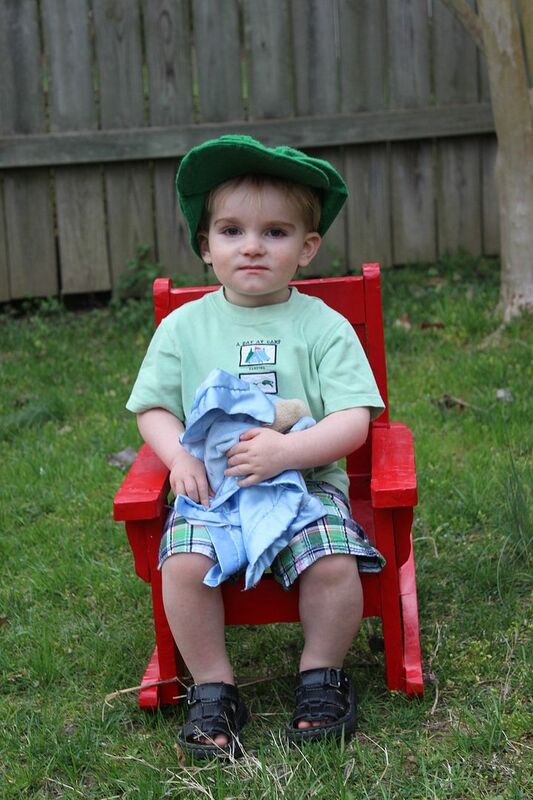 I worked a lot harder last year on hitting all the holidays and taking weekly pictures of Brody for his first year. I am slipping a little since I didn't get them shirts this year. I definitely will have to get something for baby girl next year. 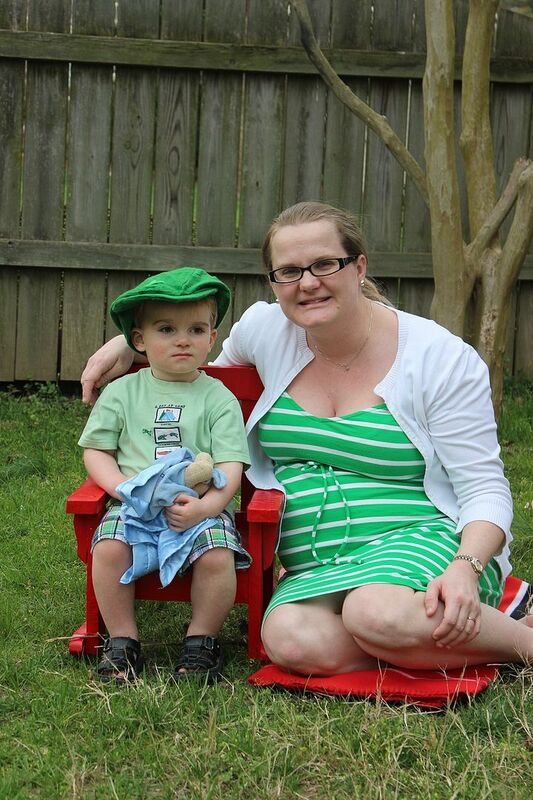 My little niece, Cate, was wearing a cute little green tutu with clovers on it. I wanted to get a picture at lunch, but I didn't have my camera. I thought I would get one later in the day, but it didn't work out. She had apparently gotten it dirty by dinner time. ;-) Yeah, the bunkbed location worked okay in a pinch. I wanted big brother in the outside pictures though. The lighting in their room is so poor right now because it has no overhead light. We installed a wall mounted light above the bed and there are two other lamps, but it just doesn't help a whole lot. I am planning to move the light fixture I made for Brody's nursery into this room when I get the chandelier for the new girl nursery. 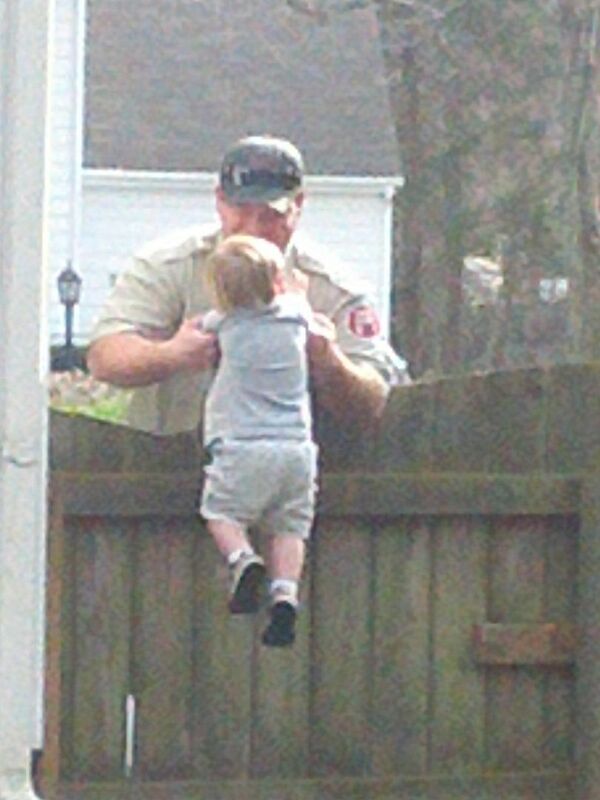 Oh my goodness, the pictures of Brody climbing the fence to get to his daddy are way too cute. I love how your husband is smiling at him. How sweet! I love your green pictures!!! That boy loves his daddy! I mean, if it is me leaving, he'll just wave and smile, but if Daddy is leaving, he'll throw a knock down drag out fit! Haha! I am jealous of your weather. We still have cold, snow and gray. But it looks like you made the most of it. I am sorry that Eddie is so busy on these nice days. It's sad that carelessness can cause so much damage. And I too see many more photo shoots on the bunk bed stairs. What a great location! Also, I love your new Spring blog look. Well, I was jealous when you were getting snow when we weren't seeing a bit of winter. Haha! But I wish I could send you some cherry blossoms so you could have a little taste of Spring. As predicted, it is chilly and rainy today if that makes you feel better. 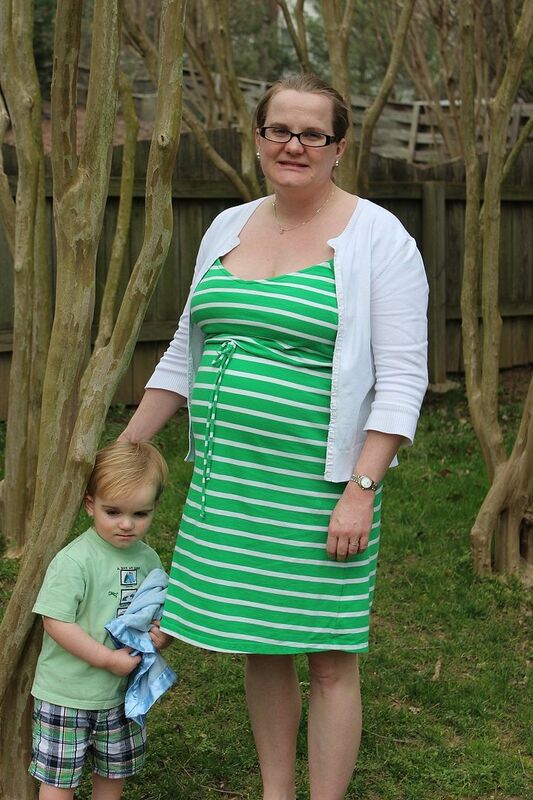 I am sure I'll change the blog look again when I have more Spring pictures to post...probably after Easter. But you have to love Brody showing off his belly button in that picture. Haha!